DesktopClock is supposed to be an alternative to the built-in system clock found on every version of Windows for at least the past 20 years. You should consider removing this program, because it is more than just a clock. It is an ad-supported program that will hamper your browsing experience with obnoxious ads. On top of that, in most cases, this clock will not even work. It might show incorrect time that you cannot adjust, or the user interface will not be visible at all. It seems that this program’s primary objective is to show ads first and time later. This adware program has been developed by an unknown entity we have yet to identify. However, this is not the first time we have encountered a program from this developer. Not so long ago we wrote about another clock called WinClock. DesktopClock and WinClock are identical programs. Even their websites are the same. The developers just made a clone of their previous release, because anti-malware programs started detecting WinClock as a malicious program. As far as distributing tactics go, DesktopClock is currently only distributed via its promotional website at Desktopclock.net. This clock is highly customizable and in a way is very similar to the clock found on Windows 7. However, not all of its functions work. You cannot change the offered background color or change the time zone. This is very annoying, so a reasonable person would be inclined to get rid of this program and stick to the clock provided by the OS. Besides, this program is a money-making machine. It preys on gullible users with deep pockets. There are two versions of this program. One is ad-supported but free, and the other is paid but shows no ads. The paid version costs $5.99, which is a lousy investment. 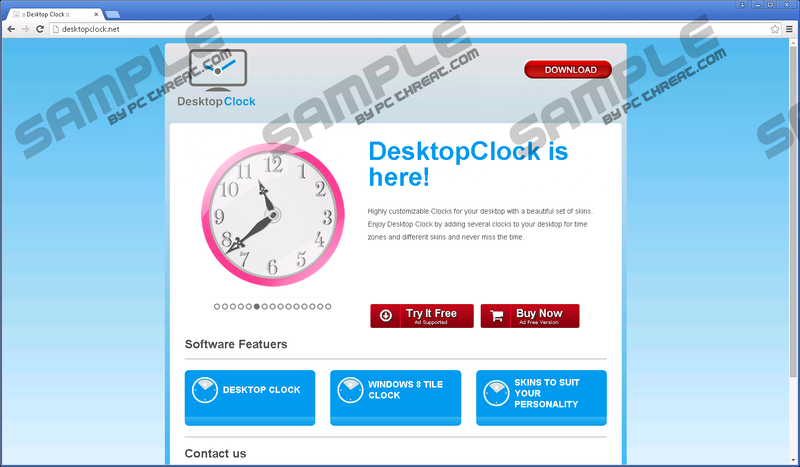 DesktopClock’s EULA states that this program “will permit third parties to, display advertising and other information within the interface of the Desktop Clock and/or in connection with the display of content and programming.” So it appears that the ads can only be shown on the program itself and your browser is left in peace. However, in the last section of the EULA it is stated that “The type of ad is dependent on the content of the page as you generally browse the internet.” So there is some confusion regarding how this program will approach advertising. Either way, the ads are supplied by third parties. So, they are unreliable, because DesktopClock’s developers are unreliable as well. Dishonest clients may be tempted to promote even more malicious content, such as browser hijackers and, in extreme cases, even Trojans. We have recently witnessed a surge in the release of Trojans so you should be more careful than ever. In must also be noted that DesktopClock can collect some information about you. This program can obtain information such as the Internet Protocol address, proxy server location, operating system, browser type, and Internet service provider. This information is needed to analyze trends and improve DesktopClock’s services. This is all well and good, but it also means that you will be subjected to tailored ads. So, you must resist clicking the ads and take steps to remove DesktopClock. Move the mouse pointer to the bottom left corner of the screen. Tap Windows Key+X and open Programs and Features. Find DesktopClock, double-click on it, and Uninstall it. Move the mouse pointer to the bottom right corner of the screen. Once the Charm bar appears, click Settings. Go toControl Panel and click Uninstall a program. Find the program, right-click on it, and then click Uninstall. Find the undesirable software and click Remove. Quick & tested solution for DesktopClock removal.